The Washington County Pit Bulls are an American Football amateur team residing in Hillsboro, Oregon that provides athletes a top-quality opportunity to extend their football playing career in an environment of good sportsmanship. These athletes have a wide array of playing experience, from no experience to professional Arena and International experience, and want to pursuit a platform for competing after their college eligibility has been exhausted. The Washington County Pit Bulls compete in the Western Washington Football Alliance that is comprised of 18 teams between Hillsboro, Oregon and Bellingham, Washington. Improve their athletic excellence and build an athletic resume. Build life skills of leadership, teamwork, and self-confidence. The Washington County Pit Bulls are a non-profit organization with strong community ties and recruits local home grown talent. The Washington County and all of its communities are proud of its athletics and proud to be the home of the Pit Bulls. Click on the link below to register for a try out with the Washington County Pit Bulls!!! Washington County Pit Bulls offense ignited with 283 total yards and 4 TDs en route to a 40-12 victory. The Washington County Pit Bulls offense ignited with 283 total yards and 4 TDs en route to a 40-12 victory. The offense led by RB/DE Jaron Jones 134 yards of rushing with two touchdowns and 102 team total yards in passing with QB Cody Patterson connecting with touchdown strikes of 26 yards to WR/DB Kevan Johnson and 64 yards to WR Andre Bradford. "This was a win that we needed badly to stay relevant in the chase for the WWFA. We had faced back to back #1 teams in the Raiders and the Rams and that tested the will of the team" Head Coach Mark Ancheta said. The running by committee chewed up yardage producing 181 total rushing yards with RB David Saylors ripping off runs of 17, 10, and 9 yards. While RB Darren Bolivar and Dealando Gray also contributing for a total of 20 yards. Jones's 12.4 yards per carry average help force the Ravens defense to be honest and play in the box. That set up Patterson's first TD strike of 26 yards to WR Johnson. When the Ravens defense was able to contain the offense, Patterson scored points in other ways. Patterson was 3 for 3 on placekicking from rages of 43 and 39 respectively and also converted on 3 of 4 PATs. The Pit Bulls Defense also got in the scoring department late in the third quarter with the Ravens backed into their end zone, LB Tre Moreland ripped the ball out of the Ravens QB trying to sneak the ball out of the endzone scoring a defensive touchdown. DB Boogie Watkins, last seasons leader in interceptions, captured an early interception in the game to help give the Pit Bulls offense as many opportunities as possible. Defensive Coordinator Calvin Bell could not have been any prouder. "That’s how a team wins together at all levels. I’m very proud of everyone. I witnessed us grow together tonight as a family". 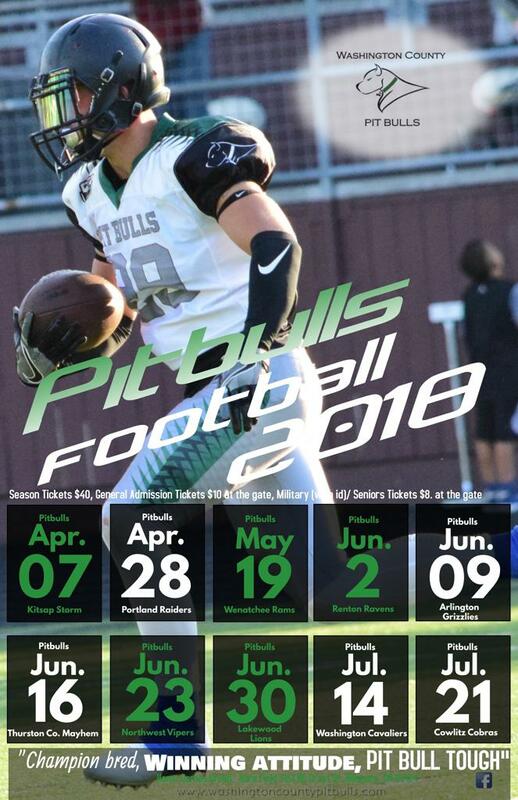 The Pit Bulls are on the road for their next two opponents travelling to the Pierce County Bengals on 6/9 and to the Thurston County Mayhem on 6/16. With the Vancouver Vipers folding, the Pit Bulls are looking for an opponent for the 6/23 scheduled game. The Pit Bulls are now 2-2 overall and 1-1 in the regular season in second place if the WWFA Division 3. The Washington County Pit Bulls would like to thank all of the communities for the support. The Washington County is proud of their sports and their local businesses. Come out and support and enjoy high action minor league football with college caliber and seasoned athletes compete and put on a good show. See you at the next home game!!! Go Pit Bulls!!! Coming off of hosting back to back #1 teams of the WWFA, the Washington County Pit bulls host the Renton Ravens. #5 Washington County Pit Bulls prepares for #1 Wenatchee Rams to come into town. The #5 Washington County Pit Bulls prepares for #1 Wenatchee Rams to come into town. The clash between cross town rivalries continues under a new league umbrella. Pit Bulls Weathers the Storm and Wins Season Opener!!! The Washington County Pit Bulls defeated the Kitsap Storm on a windy, rainy evening 22-0 in the inaugural season with the Western Washington Football Alliance. Washington County Pit Bulls joins with Westside Mobile Media to stream home game on internet radio. Home games to be treamed live on Internet Radio. The Washington County Pit bulls are ready to open the 2018 season. Riding on the success of last season's impressive performance, Pit Bull athletes are making moves. The Washington County Pit Bulls are proud to announce the 2018 season schedule!!! The Washington County Pit Bulls host the Lane County Kings in the last home game of the regular season. After a 2 week lay off and travels down to Southern Oregon, the Washington County Pit Bulls return to action at Hare Field against the Rouge Valley Trojans. The Washington County Pit Bulls continue to pick up steam with a 57-0 win over the Southern Oregon Renegades. Pit Bulls fall short of game tying score with 1:54 seconds left in regulation. Washington County Pitbulls open the 2017 season with a Victory!!! Washington County Pitbulls open the season with a Victory!!! The Washington County Pit Bulls continue to pick up key signings. The 2017 Washington County Pit Bulls Roster is starting to take shape. The Washington County Pit Bulls are proud to announce another hiring of Defensive Secondary Coach Kevin White. On a foggy Christmas Eve morning, the Washington County Pit Bulls and the Rip City Mafia held a joint practice and 60 play scrimmage. ©2019 Western Washington Football Alliance / SportsEngine. All Rights Reserved.